The ARVA Neo was discontinued in 09/2018. Summary: The ARVA Neo is a three-antenna avalanche transceiver that supports marking of multiple burials. It's an easy to use, moderately priced avalanche transceiver that works well. Searching: The Neo has a suggested search strip width of 60 meters—similar to the DSP Pro. In my limited testing, the Neo's range exceeded the Pro's by a few meters. The Neo displays an LCD direction arrow which can be set to disappear at either 3 or 5 meters to facilitate the fine search. If you are walking away from the transmitter (which is reasonable due to the way flux lines propagate), the Neo will display a U-turn arrow instructing you turn around. Spikes: Spike handling of the Neo was good. In a few orientations it wasn't perfect, but it was still good. Multiple Burials: The Neo shows up to three silhouettes on the display to indicate the number of transmitters. A plus sign appears when there are more than three transmitters. When you are within 3 or 5 meters (a custom setting), a "flag" icon blinks in the upper right-hand corner of the display to let you know that you can "suppress" (aka, "mark" or "flag") that transmitter. Pressing and releasing the intuitive Flag button will ignore the closest beacon and direct you to the next transmitter. A flag will appear next to one of the men. If you attempt to flag a transmitter when you are too far away, the word "no" is displayed on the screen. To unflag the previously ignored transmitters, toggle the Neo to Send and back to Search. Although I have done minimal testing of the Neo's flag command, the transceiver's use of a consistent image (i.e., a flag) when you are within range, on the button, and next to the flagged silhouettes is very intuitive. Controls: The Neo's controls are as simple as it gets. The power is turned on when you connect the harness' "plug" (although oddly, you connect the plug by twisting it counter-clockwise). A mitten-friendly sliding switch changes the transceiver between Send and Search. A single "Flag" button is in the center of the device. 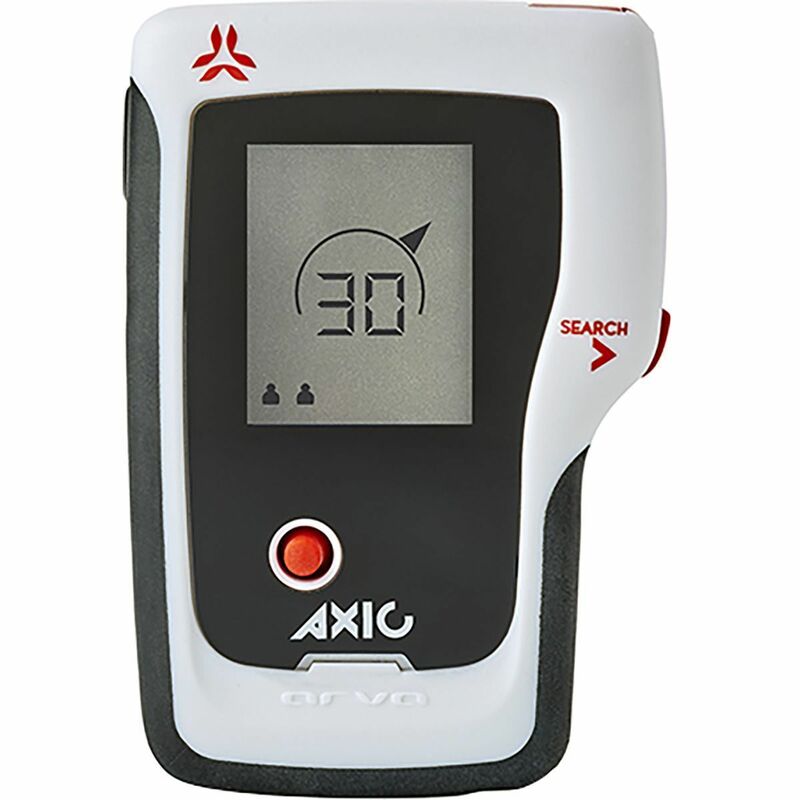 The Neo is one of the few avalanche transceivers that does not have a blinking light that shows that it is transmitting (and which would be visible when in its harness). It's worth noting that the Neo's speaker is loud. Really loud. Aging patrollers who have spent years playing with avalanche explosives will appreciate this. Group Check: During startup, the Neo displays its firmware version, the battery percentage, and then "CH" (for CHeck) for several seconds. Pressing the Flag button while CH is displayed enters the Neo's group check mode (that's not intuitive). While in group check mode, the Neo beeps if a transmitter is between 0.5 and 1.5 meters. If you get closer than 0.5 meters, it beeps loudly. You can turn off the group check mode by pressing the Flag button. 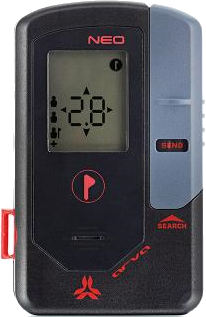 Revert to Transmit: The Neo can be programmed to automatically switch from search mode to transmit mode if 2, 4, or 8 minutes pass without receiving a signal. Auto-reverting is helpful to ensure that you will be transmitting if you get buried by a second avalanche. The downside of auto-reverting is if a second avalanche occurs while you are searching, it's likely your transceiver will be torn from your hands and your buddies will waste time digging up an unattached transceiver. The Neo gives a loud audible warning before reverting during which you can press the Flag button to continue searching. Comfort: The Neo has a neoprene pouch harness with a Fastex closure. You can remove the connector "plug" from the harness and install it on the leash so you can use the Neo without a harness. The Neo is a little larger and heavier than similarly featured avalanche transceivers. Updates: The ARVA Neo supports software updates. Read the details here. Move the sliding switch to Search. Hold the "Flag" button pressed. Turn on the device (by connecting the harness plug). Release the "Flag" button when the little clock appears in the upper-left corner and a number is displayed in the center. The auto revert time (a clock will be displayed in the upper-left corner). This can be set to 0 (disabled), 2, 4, or 8 minutes. The maximum flagging distance (a flag will be displayed in the upper-right corner). This can be set to 3 or 5 meters. Enabling or disabling the group check mode ("CH" will be displayed in the center of the screen). Set to "1" to enable or "0" to disable. Whether the "search reduction" is enabled ("Sr" will be displayed in the center of the screen). Set to "1" to enable or "0" to disable. When enabled, the Neo will reduce its reception range and flash "Sr" if there is significant interference. You should then make narrower search strips. Exit (displayed as alternating "En" and "nd" for "End). Press and hold the "Flag" button until the current value starts to blink. Press the "Flag" button briefly to move between the available values. When the desired value is displayed, press and hold the "Flag" button. This will return you to the state where pressing the "Flag" button briefly will move you between options. Select the "End" option and then hold the "Flag" button to exit the customizing. Pros: Long range, easy to use, good price, mitten friendly, customizable.